So I got a bit of a surprise this weekend. 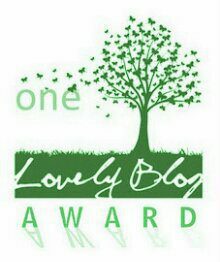 Christine over at “Readerly Musings” nominated me for the One Lovely Blog Award! Thank you so much! I’m a little shocked, to be honest, but I’m always a little surprised when anyone says that they read my ramblings here. So yeah, this was completely unexpected. 1. Thank the one that nominated you. 2. Put up the picture for the One Lovely Blog Award. 3. Tell everyone seven things about yourself. 4. Nominate seven other people and tell them that you’ve nominated them. Thanks again to Christine! And the picture for the One Lovely Blog Award is up at the top of this post, so moving on to rule #3. I love video games and play them way more than I should. My favorites include Lord of the Rings Online, Fate, Call of Atlantis, and the Portal games. Due to watching Wil Wheaton’s “TableTop” videos on YouTube, my family has discovered a whole bunch of card and board games to play together. My favorite is so far Munchkin, and I am incredibly competitive. Yes, I will backstab you! The first time I went to college, right after high school, I was a music major. My instrument was the flute, but I also played the oboe and the piano. Of the three, the only one I still play is the piano, although not very often. Last year, I finished the rough draft for the book I am writing, a YA fantasy novel currently titled Children of Light. While I love watching movies, I hate being in movie theaters, due to a combination of claustrophobia and motion sickness. I can do it, but I feel incredibly anxious the entire time. Fall is my favorite time of year. I just love it. One thing that I would really love to learn is how to read Tarot cards. It’s something I’ve never had time to sit down and study, even though I own three decks. This was really hard to narrow down, but in the end I picked seven people who are excellent bloggers who either support me in my own blogging experience or inspire me to continue blogging (or both!). Again, big thanks to Christine from “Readerly Musings” for the nomination! FATE! I love the Fate games… I have the first one on my computer and trial versions of the others… I need to buy them. Also, you’re not the only competitive person. It seems as if all of my friends are… we get along great but you break out some kind of card or board game and we’re all like “I’ll love you later, right now I want to WIN.” That being said, you should check out a game called “Pit.” It’ll REALLY bring out the competitor in you. Nice recognition for my favorite blogger. You keep blogging & I’ll keep reading:-). Congratulations! Congrats! Thanks for nominating me! Hopefully I can get a post up soon. I think it’s really impressive that you have a whole draft of a book done, hopefully you’ll get it published some day so I can read it! Nice feature of yourself. THANKS. I normally do not accept awards, but thank you very much.